A boat voyage that started like any other soon became a dramatic rescue attempt, when something unusual was spotted floating in the water not far from shore. Closer investigation revealed it to be a hawk barely floating in the water, in obvious distress. The sea was a little choppy, which probably explained its situation: a mistimed fishing attempt meant a wave caught the bird unawares, soaking its feathers and rendering it unable to take off. Perhaps sensing salvation the hawk flapped clumsily over to the boat, and we carefully pulled alongside to attempt to rescue it. Wary of its impressive talons and hooked beak, we first attempted to catch it in a large holdall, but this proved impossible with the waves. Eventually we decided to catch it with our bare hands, holding its wings to its body to prevent it flapping in panic. In fact, there was little need for caution: the poor bird was so exhausted that it put up no resistance against being pulled from the water. It was surprisingly light, evidence of its hollow bones which make it such an aerodynamic predator. We quickly transferred it to the holdall, keeping it in a dark place to attempt to minimise the stress it was clearly under. We were close to the Retreat so we took it back to shore and up to our balcony, a safe vantage point for release. 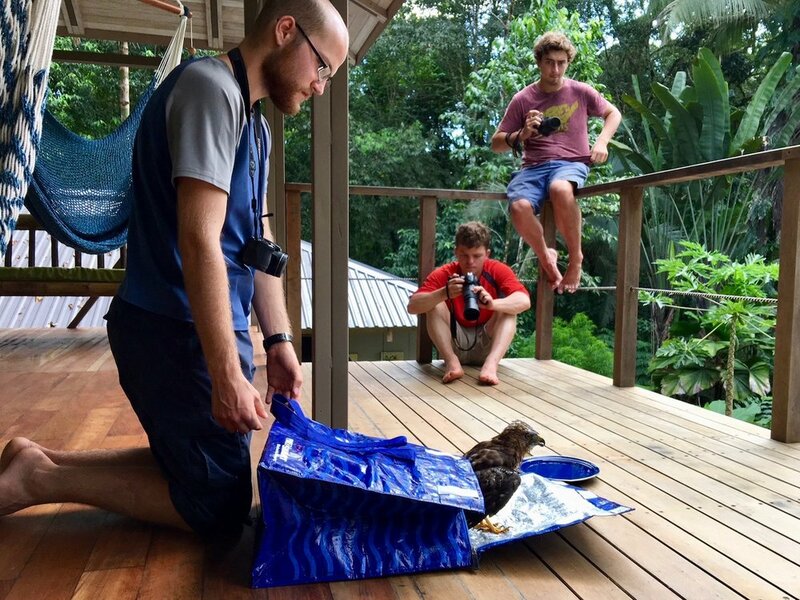 Despite its bedraggled state it was an impressive bird: its piercing orange eyes stared wildly at its surroundings, and it ruffled its beautifully banded tail feathers as it tentatively emerged from the bag. 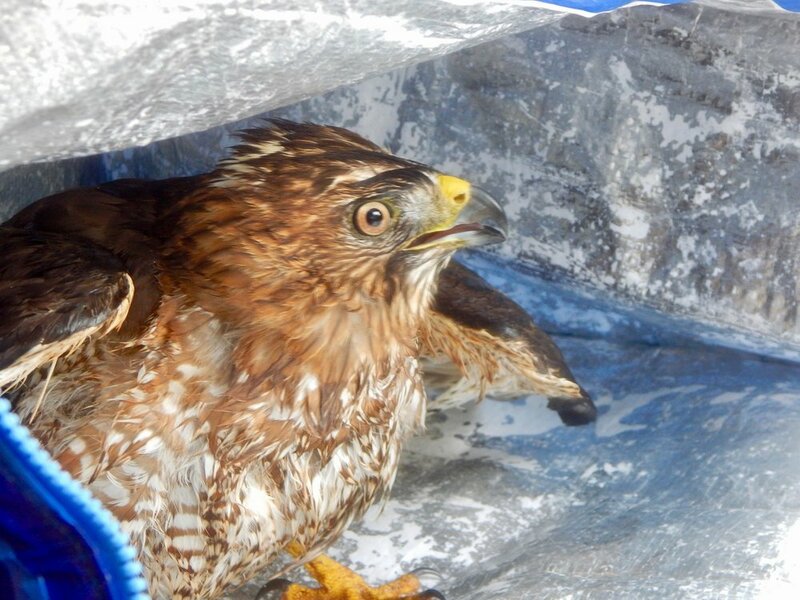 A quick ID revealed that it was a broad-winged hawk, a voracious bird of prey. With one last glance it flapped away: for a moment we were afraid it would crash-land, but it managed to pull up and land safely in the boughs of a nearby tree. Facing the afternoon sun, it spread out its wings to allow them to dry and began a keening call. Not long after, a second hawk, perhaps a relative, joined it in the tree. They stayed together as the sun set; the next morning we heard it cry once more, before the pair retreated to the forest to hunt another day. A happy ending to a soggy situation!